Soror Kallikrates is a Thelemite who associates with Blazing Star Oasis in the Valley of Oakland, California. I had heard about Thelema from a friend I met through grad school. I began showing up to the oasis sporadically and started to read Crowley and other Thelemic texts. It didn’t take long to realize that the philosophy of Thelema was something I already inherently held as my truth. Once I started to frequent the oasis, I quickly became connected to many of the members of my temple. I was drawn by the strong community of soldiers of freedom with similar aims and never looked back. Magick is many things to me. In short, magick is present in every moment. The Will is not a concrete idea or goal that one can simply “have,” but rather a fluid concept that we strive to be in line with. To me this means that my daily actions, thoughts, beliefs, and intentions are the magick. While larger rituals are important I believe it is the smaller rituals we partake in everyday, such as how we care for ourselves, that are of significance. Our Will can be found in any given moment, as it is something we can align ourselves with. It is present among us, not something in our fixed in our future. Thelema is unique in that it is radically accepting. There are no roles or boundaries to adhere to. The only sin is to not be in line with your Will, which is a beautiful and liberating concept. I can think of no other religion or philosophy that is as expansive or accepting. As human beings we each have different needs, attractions, perceptions and so forth that are constantly in flux, just as the True Will…what better way to inform a philosophy then to make it suited to each individual. Thelema is what you make it. Fraternity. I love OTO because of my Brothers and Sisters. I cannot think of another community of people that are as connected and truly supportive of one another regardless of distance or disagreements. What makes us strong is our differences. We know this, accept it, and thrive off of it. The beauty of OTO is ineffable. I remain dedicated because the Law is something I deeply believe in and am willing to fight for. Everyday Thelema gives me the opportunity to grow, contemplate my Will, surround myself with others doing the same and allow me to be myself. One of the most misunderstood aspects of Thelema is Crowley himself. People seem to condemn him for innumerable reasons which from my perspective is due to the fact that he did not appear nor make an attempt to appear perfect. People often want to see their gods, gurus, or leaders appear flawless, enlightened, and perfect. The brilliant thing about Crowley is that he was a man among men. He let his “imperfections” show and followed his True Will. Personally, I prefer and trust individuals more when they are authentic and genuine. 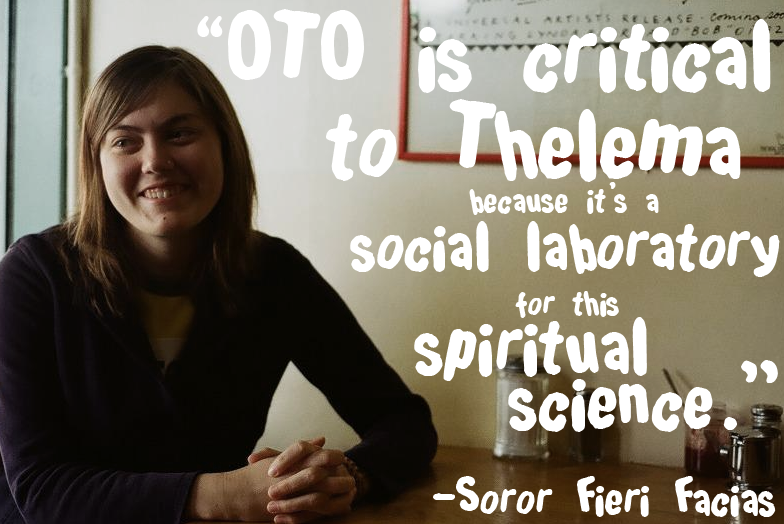 OTO is the glue that holds Thelema together in a cohesive and manageable band of soldiers. OTO gives Thelema more power to promulgate the Law and make changes in the world. It creates a community that provides the support of like minded individuals and encouragement to continue the Great Work. Solitary work may work best for some, however in my experience, what makes Thelema powerful and unique is the fraternity aspect. What I love about the mass is it’s depth. I feel as though each time I attend mass I catch or understand something new. Not only that but it differs every time depending on the mass team. It’s incredibility inspiring to watch different energies flow and work together. Everyone has their own distinct interpretations of the rubric and are able to bring that to life. It truly speaks to what Thelema is all about. Each individual star is able to burn brightly and whilst having that beautiful interplay with other stars.